Guide to the theme park (or water park) of Aqualandia in Benidorm on Spain’s Costa Blanca. Next to Aqualandia is the sister theme park of Mundomar, Benidorm’s answer to Sea World. You can buy a ticket for both or just visit them separately. Going to somewhere like Benidorm with its theme parks has become a popular way to spend your vacation time. As Orlando has its water parks like Wet and Wild Benidorm is fortunate enough to be home to Aqualandia. To book a holiday in Benidorm and its theme parks, the airports to fly into are Valencia, Murcia and Alicante, all around a ninety minute drive to the resort. Benidorm has a Mediterranean climate meaning that it has long hot summers with no rain and mild winters with a little rain. Benidorm weather is known to have over three hundred days of annual sunshine making a holiday in the sun in Benidorm a fantastic way to spend the summer. Make sure to pack a lot of sunscreen as spending a whole day in the Benidorm sunshine is not good for your skin! Aqualandia one can almost say is located in downtown Benidorm. The park is visible from far as one can see the flumes and slides on the hillside. Parking is free, and there is also a tram and bus service from most parts of Benidorm to Aqualandia. There are over twenty rides and flumes located around the Aqua landia theme park. Here is a list of the flumes and rides. The Black Hole, a ride in the dark, Big Bang the ultimate free fall , Amazonas, The Rapids, Zoo Immersion, Splash, Kamikaze and Vertigo. 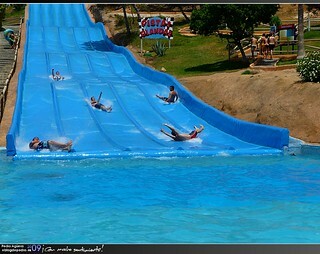 The Rapids, fun for the whole family, The Zig Zag also has a mini version for the little ones. Laguna for fitness fanatics with nets and rings, Niagara, Atlantic Surf and Adventureland a super water play area for little children who can’t swim. There are cafeterias and rest areas scattered throughout the park. Aqualandia and its sister park Mundomar next door are renowned for their good quality food at reasonable prices. There is also a boutique where you can buy your souvenirs to take home. Look for your picture at the park’s entrance. These aren’t cheap but they are good quality and a wonderful memory to take back home. So how much do 2015 tickets for Aqualandia cost? Aqualandia is open from 18/05/2015 until 29/09/2015 from 10:00 until 19:00. Tickets are priced at €30 for adults and €24 for children. From May until the 19th of June Aqualandia is only open at the weekends and this rule also applies for the month of September. Aqualandia discount tickets and vouchers can occasionally be found at McDonalds, the Eroski, Benidorm La Marina shopping mall and Carrefour in Benidorm so keep a look out for them at the checkouts. The vouchers are normally a two for the price of one or give a €3 discount per person not to be used with other special offers. Aqualandia season tickets can be used for Mundomar next door. If you buy your tickets at the station the bus and tram to Aqualandia is free. Also available in the park on the day are vastly discounted tickets to the sister park Mundomar next door if you don’t want to buy a season ticket and just spend the evening there marvelling at the aquatic animals and shows. Other Benidorm theme parks to spend a day out would be Terra Mitica, Terra Natura and Aqua Natura and Mundomar. Below we have a interactive Google map of Aqualandia for visitors and tourists wanting directions to Aqualandia, when visiting the water theme park on the Costa Blanca coast of Spain. You can change the street and road map view to a view of the terrain of Aqualandia or you can choose a Google Earth satellite view of Aqualandia which shows you actual images of Aqualandia from the sky above. The Aqualandia map is interactive because the buttons in the top left corner enable you to zoom in or out and move up, down, left or right using the keys at the top left corner of the map. Use the arrow keys to move about the map. You can also choose the point you want to have in the centre of the map by double clicking on that point.